This podcast is an excerpt from Dr. Robin Murphy, ND's "Comparative Materia Medica" lecture CD set. 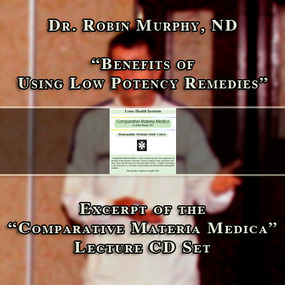 Dr. Murphy speaks on the Benefits of Using Low Potency Remedies in Homeopathy. A study of remedy groups with comparisons and keynotes of Calcareas (Calcium), Natrums (Sodium), Kalis (Potassium), Ferrums (Iron), the Mercuries, Acids and Snake Venom's. Synthetic Prescribing is also discussed as a technique of prescribing and understanding homeopathic remedies.